Take a trip to a magical woodland in Wild Pixies, a fantasy-themed slot game from developer Pragmatic Play. It’s a 5 reel, 20 payline title that comes with a feature round where you can win up to 20 free spins complete with up to 6 roaming wilds that shift around the reels on each spin. Play on your PC, tablet or mobile from between 20p and £100 per spin. There’s a suitably fantastical feel to the design here. With a forest in the background the reels include lower value A to 9 symbols as well as a quartet of pixies. The pixie king is the top paying symbol, awarding 2.5, 7.5 or 12.5 times your total stake if you land 3, 4 or 5 across a payline. The wild can land on all 5 reels. As well as replacing all other symbols apart from the scatter it also delivers payouts of 5, 12.5 or 25 times your total stake. Land the scatter on reels 1, 3 and 5 on the same spin and you’ll trigger the Roaming Wilds Free Spins feature. If you hit the scatter on reels 1 and 3 but just miss out on the third you could benefit from the Scatter Nudge feature - this moves the reel up or down to deliver the all-important triggering third scatter. Once the round is live, you’ll receive 8 free spins. Every time a wild lands, it fills 1 of the trio of 2-space meters. Once a meter is full, the wilds drop onto the reels and become roaming wilds. They dart round the reels on to new reel positions on each free spin. Wild Pixies lives up to name perfectly. The theme is pixies and the best winning chances come from the wilds in the bonus round. The genre might be gentle but the medium to high variance is volatile enough to keep things interesting – top payouts are 1,000 times your stake on every spin. 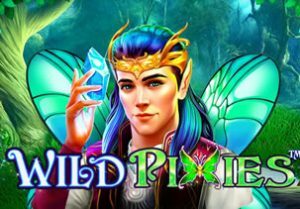 It’s not our favourite theme but Wild Pixies is a typically solid all-round slot game from Pragmatic Play. Saying that, the developer offers much better slot games including Mustang Gold and Da Vinci’s Treasure.